A resolution for developing the old South Shore Hospital site may finally be at hand. After developer Russell Galbut reached a tentative agreement with neighbors and the Commission’s Finance Committee to build a 44-story tower on the 500 block of Alton Road and build and deed a 3.2 acre public park to the City of Miami Beach on parts of the 600 and 700 blocks, he was back in City Hall to present the updated agreement to the Land Use and Development Committee where it was well received by Committee members. The Land Use Committee will formally vote next month on changing the City’s Land Development Regulations (LDRs) to give Galbut the right to combine the FAR (floor area ratio or density) on the property to build the tall slender tower and allowing the area for a park. Currently, the height limit on the site is 75 feet and 7 stories. Galbut has approved plans (below) to build a large low-rise development that would cover most of the area and leave little room for green space. In what he said was his 96th meeting on the project, Galbut said the taller tower and reduced retail space represents a reduction in intensity and density going from 504 approved residential units to 410 and from 75,000 sq ft of retail to 15,000 sq. 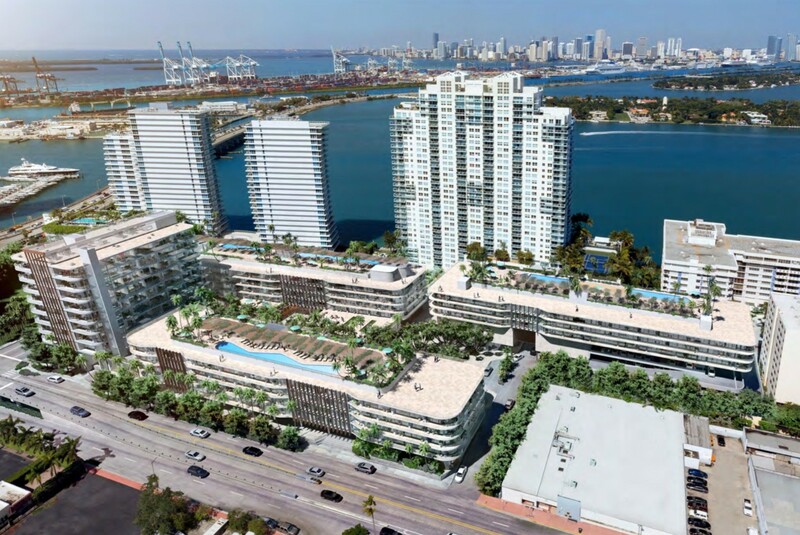 ft.
As the City looks for aesthetically pleasing blue and green solutions to the sea level rise problem, Galbut said The Park on Fifth development will have “the largest amount of permeable space in Miami Beach. I think that’s turning out to be one of the biggest benefits of this entire task. That is priceless. It’s a down payment on true resiliency.” It will also include “subterranean parking capable of holding water in the event a major [flooding] event were to occur." The retail space will include a green roof. The donation of the park, he said, will increase the City’s total parkland by over 1%. He noted there are 250 acres of parks in Miami Beach, excluding golf courses. The development also includes the ability to build an extra lane leading to the MacArthur Causeway. To build the park, the City needs to “vacate” 6th Street which means the allowable FAR from both sides of the street can be combined for the taller tower on the 500 block. There is no physical change to the street, the vacation is a technical term allowing the density to be combined. The Land Use Committee will take a formal vote on the item in September which will then go to the full Commission where it requires a 6/7th vote. Carpenter responded that there was some confusion created by the overhead rendering (above) which shows the green roof on the proposed retail space but he confirmed that the actual 3.2 acre park that will be deeded to the City will be at surface level. Daniel Ciraldo, a community activist who has been making a strong push on social media for the City to acquire the property and build its own larger park, asked about the true value of the donated land given that it would no longer have development value. 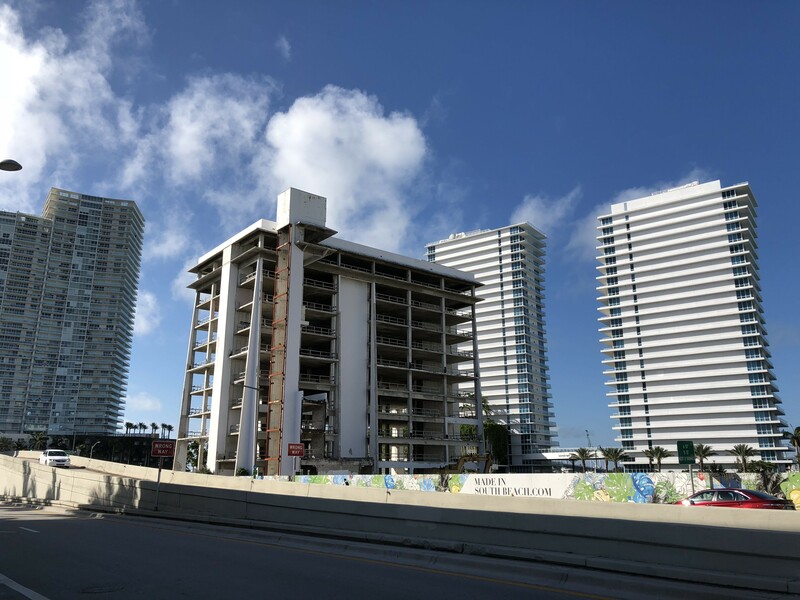 Carpenter explained that an outside professional appraiser had determined the additional value to the developer between the currently approved project and the tower was $50m. The appraiser also considered “how much revenue would be generated by the increase in value… there is an increase in the tax base with a highest and best use development on the site,” he said. Still, not everyone was happy with the proposal. Tensions flared between residents who live in the neighboring buildings that overlook the site, which currently is a combination of vacant lots and the shell of the old hospital and residents who live further away. Edward Martos, the attorney for the Floridian, called the building “the most affected” by the proposed development. He said the 334 residents there have been working with Galbut for over five years and are “strongly in support” of the project. Martos and Allan Kleer, a member of the Bentley Bay Board of Directors, have been a consistent presence at the public meetings. Kleer said there are “2,000 condo owners and voters” at Bentley Bay. “The vast majority of us feel this is a great deal for the City. Move this project forward and solidify this great deal,” he told the Committee. Committee chair John Alemán noted two requests she made that were incorporated into the draft agreement, one to ensure the Certificate of Occupancy would not be issued for the project until the park is complete. “That makes sure the park gets completed with the building,” she said. She also asked that the development rights not be transferable until the Certificate of Occupancy is received. “Both of those terms have been agreed to,” she said. As noted, the LDR changes require a 6/7th vote of the Commission. While none of the Commissioners are bound to their votes when the project gets to the full Commission, at this point, all but one have either voted in favor of the deal at the Commission’s Finance Committee meeting or expressed support in other ways from the dais. Commissioner Micky Steinberg is the only member who has not opined. Discussions began earlier this spring when Mayor Dan Gelber challenged the community to find a solution to developing the long-vacant site. Note: The photo above is a rendering of the previously proposed 42-story tower. New renderings at 44-stories have not yet been provided.